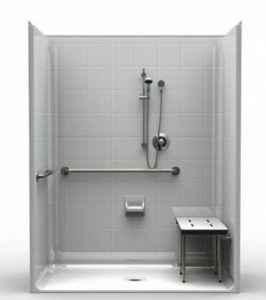 To meet ADA wheelchair accessibility and safety guidelines for bathrooms, our ADA compliant showers are built for the demands of healthcare facilities, assisted living homes, retirement communities and university dormitories. Designed to allow wheelchair users easier access, these roll-in showers have a tough composite wall structure and a beautiful gel coat finish, which makes them durable and easy to maintain. Our complete line of one-piece and multi-piece ADA compliant showers meets the criteria for accessible shower design. 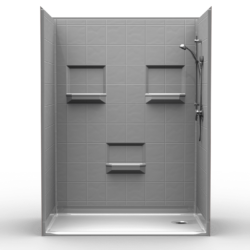 We supply showers with minimum interior dimensions of 36″ x 36″ (for transfer showers) and 60″ x 30″ (for roll-in showers). Backed by our exclusive 30-year limited warranty, and the expertise of our team, you can trust us to deliver the best ADA compliant shower for your job. A full plywood backed wall. Shower accessories, which can come pre-installed in a one-piece unit. Leak-proof SnapJoints for locking water tight corners. Easy to clean and maintain gelcoat fiberglass walls. Pre-leveled shower pans (no mud setting required). Anti-slip floors and wheelchair accessible thresholds. 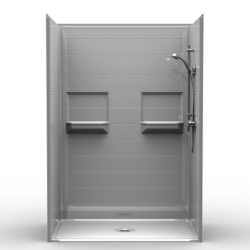 Our superior quality one- piece showers are ideal for new commercial construction projects. These showers can also come with pre-installed accessories, all you have to do is install the shower and connect the necessary plumbing. INSTALLATION IS QUICK, SAVING YOU TIME AND MONEY. 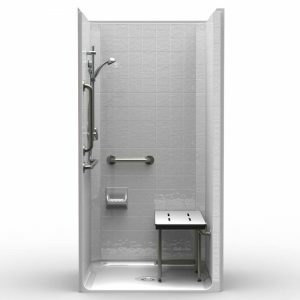 A perfect way to improve accessibility for retrofits in existing facilities, our ADA compliant multi-piece showers feature an innovative leak-proof snap-joint system to facilitate installation and a wide range of accessories are available for purchase. ORCA HealthCare’s Speed-It-Up ADA One-Piece Shower Packages are processed within 24 hours after your order is placed. We also offer free shipping, and delivery with a tailgate service. In addition to our quick turnaround, you can expect your one of our six available ADA shower packages to arrive at most North American (U.S. and Canada) locations within 3 to 6 business days. No matter the project, we’re here to help. Our team of experts have the necessary knowledge to answer any questions you may have. For more information on our ADA shower products for commercial facilities, or to discuss the details of your new construction project, simply contact us. We’ll make sure to get back to you as soon as possible.